A couple of weeks ago Becky and I visited Portland, Oregon, to see friends. While there, we had the opportunity to visit the Japanese American Historical Plaza, which is part of the Tom McCall Waterfront Park. 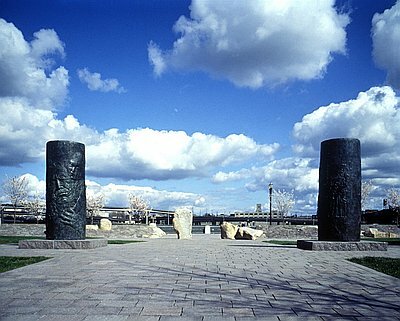 The memorial was designed by landscape architect Robert Murase and dedicated in 1990. The purpose of the memorial was to highlight and remember the injustices faced by Japanese Americans in Oregon, following the infamous Executive Order 9066, signed by President Roosevelt, on February 19, 1942. This order led to the forcible removal from their homes of some 120,000 West Coast Japanese Americans, nearly 2/3 of whom were American citizens. To read a 14-part series that I wrote about the internment, Start Here. Also, in an effort to shine a light on the injustice of the Japanese American internment of World War II, I wrote an historical novel entitled How Much Do You Love Me? Aside from my desire to create a page-turning mystery, my objective was to summarize the complete experience of the internees, throughout their wartime experience. To read a critical review of my book from Kirkus, a respected national book review organization, please Click Here. To order How Much Do You Love Me? from Amazon, please Click Here.